You are here: Home / Stock Screens / Should we Accumulate Shares? 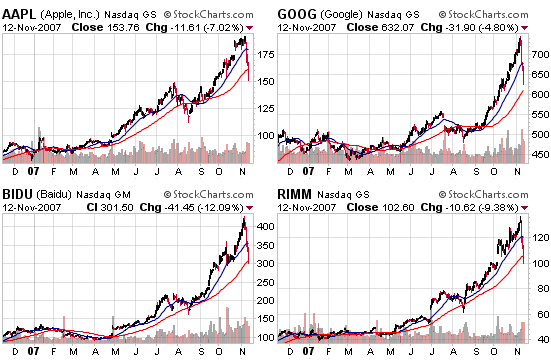 The stocks below represent current leaders that may be presenting opportunities near the two major moving averages. The first list presents stocks at or near their 200-d moving averages (they are also trading below their 50-d moving averages). The second list contains some of the largest gainers of 2007, the leaders just about every stock blog has been covering over the past 6-12 months. These stocks are trading at or near their 50-d moving averages with further room to correct as their 200-d moving averages are considerably lower than their current trading range. The bull may have another leg and if it does, these stocks should present some of the best risk-to-reward ratios moving forward. Don’t question the setups! Take the trades, accumulate shares and only sell if the setup fails and reaches your maximum risk. SLB – 91.04, look for the stock to correct down to the 200-d moving average and build a base for the first time since the up-trend started in early 2007 at $60 (it successfully completed the $60-$100 run). GRMN – 82.32, the former high flyer is down $40 as it approaches the 200-d m.a. for the first time since early 2007. A base here is a great accumulation opportunity. STLD – 46.80, allow the stock to correct and gather support just below the 200-d m.a. and then add shares (this strategy has offered solid risk/reward over the past couple of years). CELG – 62.28, the stock is currently setting up its fourth 200-d moving average base over the past two years. Set the risk/reward and pounce. PCU – 103.00, look for support to build above the 200-d m.a. which is also near the psychologically important triple digit threshold. What an amazing run! NVDA – 30.03, allow the stock to correct further towards the 200-d m.a. and wait for support to form before setting up and ideal accumulation point. GOOG – 632.07, the stock has shed more than $100 over the past few days as it looks to find the first level of support at the 50-d m.a. The 200-d m.a. currently sits near $520. I wouldn’t be surprised if it corrected down towards the 200-d m.a. BIDU – 301.50, this stock has been hit very hard over the past five days as it has lost more than $125 from its peak high. Baidu is currently sitting at the 50-d m.a. with its 200-d m.a. just above $183. RIMM – 102.60, Three days of hard drops as the stock now sits at the 50-d m.a. for the first time since August (and June before that). The 200-d m.a. is currently below $70. EDU – 68.40, the Chinese leader is touching its 50-d m.a. for the first time since late summer with its 200-d m.a. down near $52. JASO – 48.67, the stock made a large reversal up near $72 which sent it into the current correction back down near the 50-d m.a. Volume has increased immensely. BX – 22.26, the stock took a hard 8.32% hit yesterday and continues to struggle near the 50-d m.a. It is still above the prior support of $21.30. I still like the stock long term but some concern has crept in. I have loved GRMN in the past, but I’m a little worried about it right now. The company may be taking some missteps and I worry from a fundamental valuation basis that the company doesn’t look as solid as it used to. I like NVDA a lot for a trade, and CELG looks very good too. 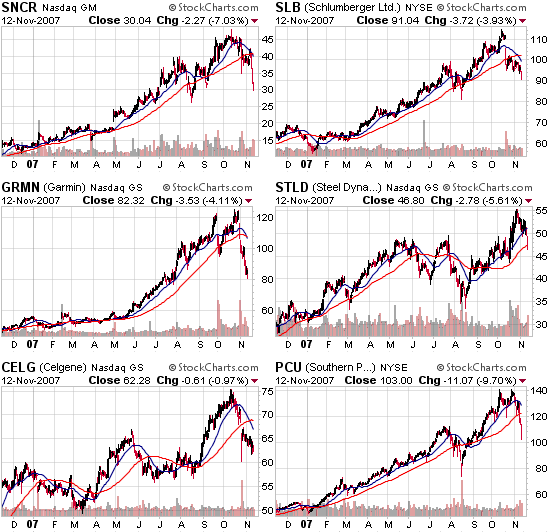 So many high quality stocks pulling back makes me wonder why. Are we looking at a correction as negative news is finally starting to sink in? I would wait and see how Christmas sales numbers look before buying up something that could dip even further. Of course in the very short term there will be some sort of bounce to play off of. GRMN is flying in pre-market trading. Up 23%. Im a big fan of your site. I was just curious to know if you are currently invested in any/all of these positions right now. Im interested to see what your take is on how likely it is that continued bearish movement and even a recession could trigger the stops on most of these positions. Thanks, and keep up the good work. 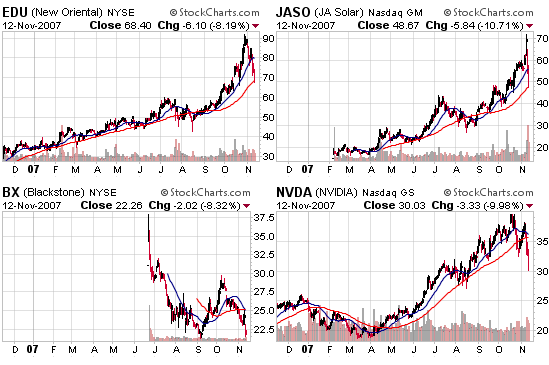 I currently own shares in AAPL, GOOG, EDU, BX and JASO. I am looking for possible basing buys in GRMN, RIMM, SNCR and others. hey chris i can see the makings of a cup handle base starting to form on RIMM right around the 50MA. do you think that the tanking of tech stocks this week will bring about a more attractive entry point to this base? I have a post in the waiting on RIMM for Friday as part of the current x-mas list theme I am doing. just curious to know if you see GOOG and AAPL as they approach theyre 50ma, do you think these are good accumulation areas in the current stock climate we are in or do you wait to see if they get close to the 200ma? thanks for your insight chris, i am still trying to fully understand your implementation of buys in as many stock scenarios as possible.